As the summer wears on—and I’m wondering what I am doing working long hours in a big city while everyone else seems to have escaped to beaches or mountains or on other adventures—I’m returning to my series based on the ideas of pop philosopher Alain de Botton. As those familiar with his work will recall, de Botton maintains that art can provide relief from as well as solutions to one’s angst. But does the art we expats produce play a role in improving people’s lives? That’s what this series of posts explores. But are the works expats produce too specific to their own situations, or do these works, too, speak to broader life problems? De Botton outlines six specific ways art can respond to human needs. My last post examined his first principle, that art can compensate for the fact that we have bad memories. I offered some examples of how international creatives have preserved precious moments of their lives in other countries in their works, not only for themselves but for posterity. 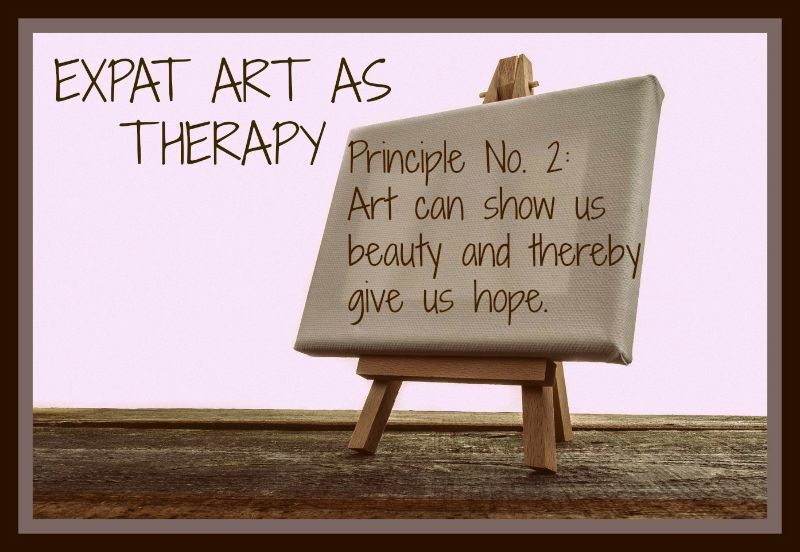 PRINCIPLE #2: Art can give us hope. Simple images of happiness touch us. We tend to be moved by small expressions of beauty—not because we are sentimental but precisely because so much of life is not pretty. 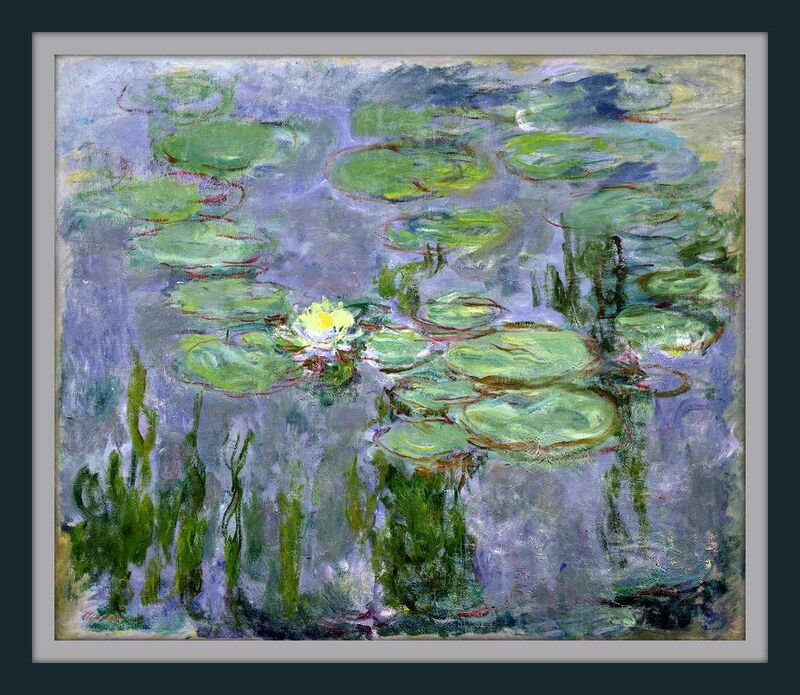 The example de Botton cites is Claude Monet’s Water Lilies, (or Nymphéas), a series of around 250 oil paintings that depict the French impressionist’s garden at Giverny. Monet painted the series during the last years of his life, while suffering from cataracts. Nymphéas, 1915, Musée Marmottan Monet, Paris. via Wikimedia Commons (public domain). De Botton is of course stirring it up by insisting that beautiful art serves an important purpose. Artists of today seem to be in a race to outdo each other in the outrageous stakes. I’m thinking of Damien Hirst, who built his reputation on artworks displaying dead animals, or their parts, in formaldehyde tanks. Providing a respite from the ugliness of life is the last thing on his mind. Likewise for Jen Lewis, who uses her own menstrual blood to create abstract designs. Provocative, yes, but not my idea of beauty. By way of an answer I’ve arranged a small “exhibition” of works by four visual artists, three painters and one photographer, all of whom have been affiliated in some way with the Displaced Nation. As de Botton has done at several museum exhibitions, I’ve added post-it notes describing the therapeutic effects I’ve experienced upon viewing these artists’ works. POST-IT: Those of us who have traversed international boundaries carry in our hearts the fear that we may someday lose our way—literally, of course, but even figuratively, with no family or old friends around to serve as mentors or sounding boards. 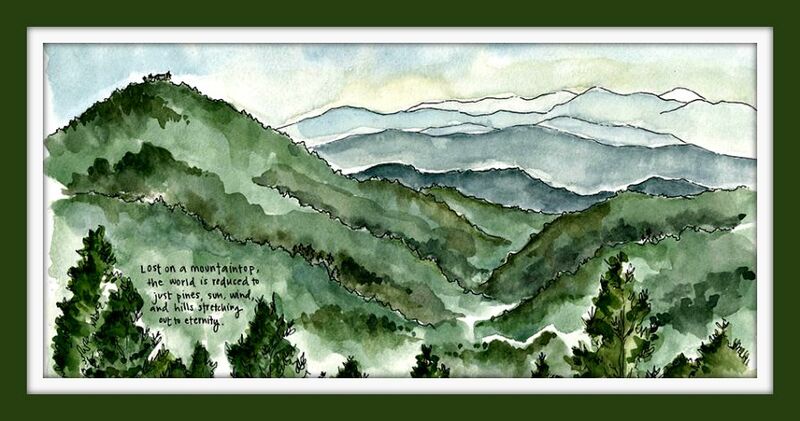 Candace Rose Rardon shows us the flip side: how glorious to be lost on the top of a mountain range with the world stripped down to pines, sun, wind and hills, ready for you to paint your own scenes on it. Even a stay-at-home curmudgeon could be struck down with wanderlust, at such a prospect. Candace is a writer, sketch artist and illustrator without a location. She tells stories about the world through her words and watercolors. OUR CONNECTION: Candace was the recipient of one of our Alice Awards. SEE ALSO: Candace’s blog, The Great Affair; and her first book of travel sketches: Beneath the Lantern’s Glow: Sketches and stories from Southeast Asia and Japan. POST-IT: My first (and only) visit to Nagasaki, made while I was living in Japan, had a lasting impact. To this day I carry around images of the damage wreaked on that city from my visit to the Atomic Bomb Museum. But for Julie, who moved to Nagasaki from the United States to teach English, the city was the place of her rebirth as an artist. 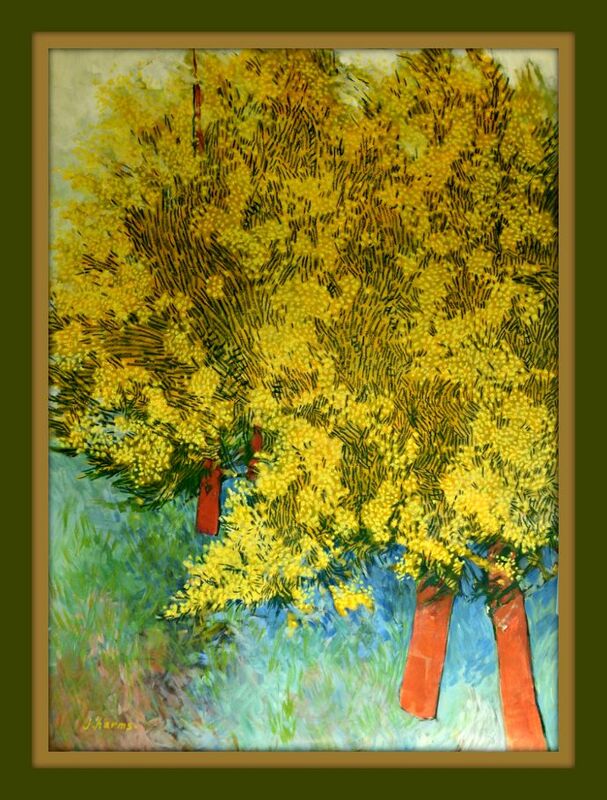 She often walked to this local park, and this painting is her tribute to its flowering mimosa trees. For a moment her painting makes me forget the pain this city endured, along with the horror for war it engenders. Though one can never lose sight of the darkness, it’s possible to be touched by these simple, beautiful trees. OUR CONNECTION: We are mutual blogging admirers. Julie, btw, has now moved to France, where she continues her work as a fine artist (hence the French title of her painting). SEE ALSO: Julie’s portfolio site. POST-IT: I’ve never been to Phnom Penh but imagine it might be a variation on other Southeast Asian cities (Bangkok, Kuala Lumpur, Jakarta, Saigon) I’ve visited. From reading descriptions of the Russian Market, which lies in the southern part of Cambodia’s capital city, I can certainly picture it: a narrow warren of stalls, crowded, busy and sweltering, full of the kinds of goods you see in all of the markets in that part of the world (though apparently at better prices), everything from handicrafts to fake Swiss watches to pirated software to designer clothes considered unfit to be shipped abroad because of small flaws. The global economy at its finest! But what does writer and sometime photographer A. Spaice offer us? 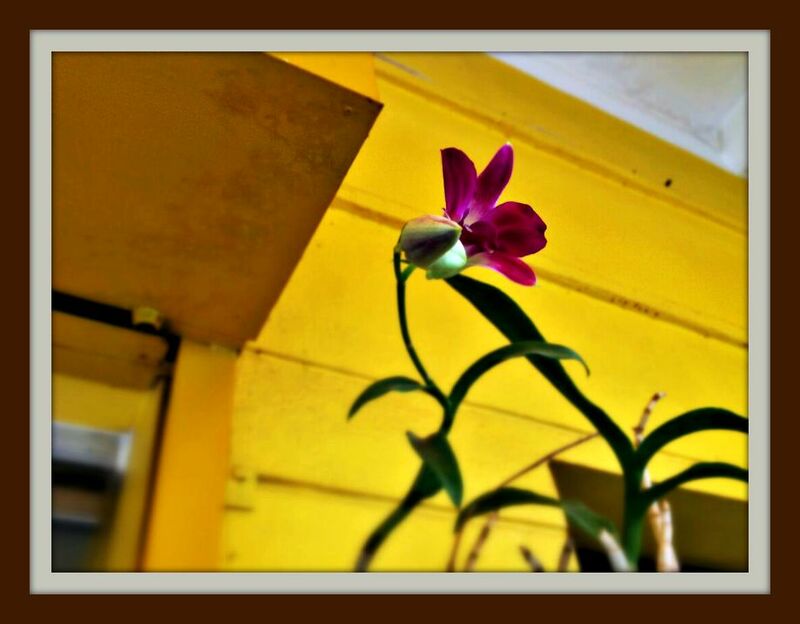 A glimpse of a splendidly isolated flower and flower-to-be. Such a beautiful reminder that the “I shop therefore I am” credo of Asia isn’t all there is to life! OUR CONNECTION: A. Spaice was our first international creative to be “wonderlanded” (read her interview and an excerpt from her short book, Bangkok). SEE ALSO: A. Spaice’s Design Kompany site and weekly e-zine. POST-IT: The Pampas grasslands of Argentina are one of the most fertile areas in the world. When a drought occurs and its crops are destroyed, not only farmers—but also does the rest of the world—suffers, as world food prices are nudged higher. 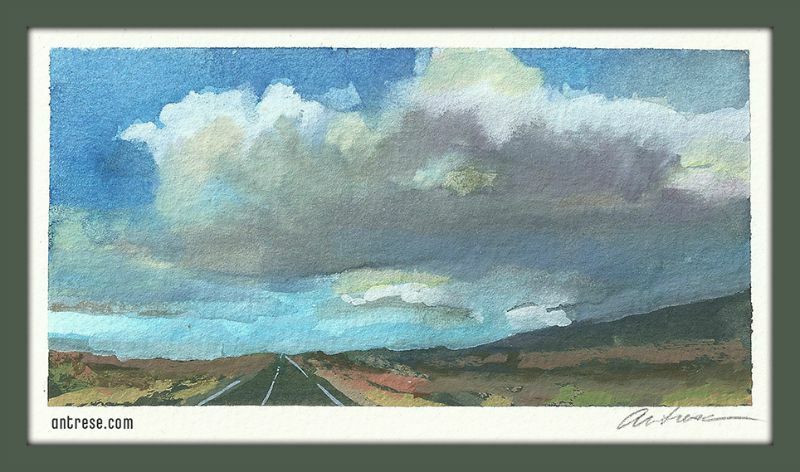 Antrese’s painting of the grasslands landscape “after the drought” reminds us that even when nature gives the earth and its inhabitants a terrible beating, the rain returns eventually and the beauty of the landscape is restored. If a glimpse of such beauty helps us forget the pain even for a moment, then perhaps it is possible to regroup and carry on. (Note to self: Come back to this painting once the dog days of August have arrived.) An American married to an Argentinian, Antrese has been living in Argentina since 2011. SEE ALSO: Her portfolio site and her podcast series for artists, SavvyPainter. Note: All four artists’ works are reproduced here with their permission. So, readers, what do you think of the above “exhibition” of works that capture unexpected moments of appreciation for life’s beauty? I know that writing about these works helped to lift me out of my late-July funk, but did you, too, find it therapeutic? And are there other expat works you would recommend for this reason? Do tell in the comments.